It should be no surprise to anyone that the escalating issue of homelessness was barely mentioned during four days of rhetoric and self-congratulation at the Conservative party conference. With the Tories having overseen the most savage cuts to the poorest in society in a generation, it was inevitable that homelessness would indeed be on the rise in Britain, and off the agenda of the Conservative Conference 2015. For all of their rhetoric and false promises, like the hollow Housing Bill, or the wolf in sheep’s clothing Living Wage, the Conservatives have shown yet again that their priorities do not lie with society’s least fortunate. The number of people sleeping rough in Britain has risen 55 per cent since the Conservatives came to power in 2010, with London seeing the highest increase. In 2008, Boris Johnson pledged to end homelessness in London, but the following year the Combined Homeless And Information Network (CHAIN) reported that 6,508 people slept rough in the capital in 2012/13. More recently, it was discovered that 13,850 households were accepted as homeless between April and June of this year, a 5 per cent increase across England and a 10 per cent rise in London. Factor in the cuts to housing benefits for 18 to 21-year-olds, and the lack of a plan to tackle this crisis, and it may be a foregone conclusion that this increase is going to continue. Many more people will be sleeping rough in the capital and elsewhere over the course of this parliament. Homelessness is clearly not high on the Conservative party’s agenda, and their attacks on welfare and housing have only confirmed this. Yesterday David Cameron promised an, ‘all out assault on poverty’, but his track record so far suggests that homelessness does not come under this remit. Instead, Cameron launched his proposal to build 200,000 new starter homes, intended to ease the housing crisis. While this will help – insofar as there will be more homes in the country – it will have no impact on those in poverty. The homelessness charity Shelter has suggested that only those households earning over £50,000, or £70,000 in London, will stand a chance of buying these houses. And of those on the new living wage in poorer areas? Only 2 per cent will find these new homes affordable. With the Tories either incapable or unwilling to focus any attention on the homelessness crisis, Labour missed a golden opportunity to scrutinise the government’s terrible record on the issue at the last election. One of Labour’s main strengths is its compassion in the face of ruthless Conservative ideology, yet homelessness was notable by its absence in the last Labour manifesto. Under the leadership of Jeremy Corbyn, who has been a passionate advocate for the homeless, Labour can finally take the lead on the issue. That is why the Labour Campaign to End Homelessness has been set up, with the intention of enshrining a pledge to end homelessness in the 2020 manifesto and eradicate it completely by 2030. It is crucial that this issue is at the forefront of Labour thinking in the next five years, not only to show our compassionate side but to help those who for various reasons have found themselves living on the street in the world’s fifth largest economy. With greater awareness, a consistent house-building scheme, greater involvement from local authorities, greater co-operation among local government, the NHS, the police, charities and community organisations, as well as proper funding, homelessness in Britain could be a thing of the past. 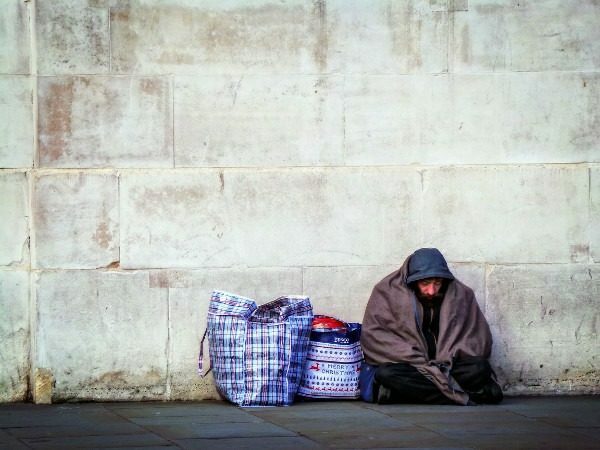 Britain could emerge as one of the world’s leading humanitarian nations on the homelessness issue and make a huge impact on the lives of thousands around the country. Whether this can happen under a Conservative government, however, remains to be seen. an “all out assault on the poor,” more like! At least on the evidence so far, while the hyper rich get hyper richer by the day. How can you take an article seriously, when they don’t know the difference between the 2 words, ‘homeless’ and ‘Roughsleepers’, and mix them up in a Fuzzy Wuzzy way, as they do our problems. How can they begin to formulate policy on the subject that would be at all useful to us. They are just collating convenient clichés from the charities that scam on our backs, for their own salaries, and manipulate these words, and then joining in with the jolly for political propaganda against their opponents. We are being used again. ‘RoughSleepers’ sleep outside of homes! ‘RoughSleepers’ are a minuscule small number that could be helped easily, but that is inconvenient to the charities that needs large numbers, for large salaries. Genuinely helping us would be cutting their own throats. We are needed on the streets for the emotion propaganda of their news adverts. The more that die, the better. ‘Homeless’ is a ‘catch all’ expression, used as a statistic bulking word, to get more salary money, from government & people that think that they are giving for help to ‘RoughSleepers’. ‘Homeless’ includes anyone that has not got their name on the rentbook, and would have no legal right to continue the tenancy, if the named tenant was to leave, or die. A person is considered ‘Homeless’ if they no longer have a legal right to occupy their accommodation, or if it would no longer be reasonable to continue to live there. This is a massive ‘catch all’, and includes students that have gone back to their parents from Uni, and the recent ‘sanctions’ have encouraged all clever people to take their name off the rentbook, and live at the same address as ‘homeless’, with their partner, parent, accomplice, to avoid workfare availability, council tax, rent, sanctions, work experience, job search, etc. Some ‘Homeless’ are extremely rich businessmen, making a very lucrative living on the misuse of this word. Big Issue sellers use this expression to get sympathy, and lots of ‘cloaked begging’ donations for their drugs. Neither are ‘RoughSleeping’. 91% of professional beggars misuse this word, and are not ‘RoughSleeping’. Fake charities use this expression when writing. They interspace descriptions of how terrible it is to ‘Roughsleep’, then because there are not many of us, quickly switch to the statistics of ‘Homeless’, and hope that you didn’t notice the quick switch. The charities that use this expression to get more salary money, are just as guilty of the fraud. They would prefer to deal with ‘Homeless’, because, unlike the ‘RoughSleepers’, there is no call on their time to provide for them. Smudging the words ‘RoughSleeping’, & the much bigger number of ‘Homeless’, diminishes the real hardship of the former. I will paste below the collated differences.
.	RoughSleepers: sleep outside of homes.
. Homeless: live in homes that they have no rights over. eg. Parents’, girlfriend’s, partner’s, friend’s.
. Both can be totally exclusive of the other.
.	‘One’ is ‘slightly’ more testing than the other. 1. ‘Homeless’ includes anyone that has not got their name on the rentbook, and would have no legal right to continue the tenancy, if the named tenant was to leave, or die. 2. A person is considered ‘homeless’ if they no longer have a legal right to occupy their accommodation, or if it would no longer be reasonable to continue to live.
. There may be other reasons why you should be considered ‘Homeless’. Even if you don’t fit into one of these categories you may be able to argue you are ‘Homeless’ because you can’t stay where you are.
.	A household is legally ‘Homeless’ if, either, they do not have accommodation that they are entitled to occupy, which is accessible and physically available to them or, they have accommodation but it is not reasonable for them to continue to occupy this accommodation.
. This definition is much wider than rough sleeping. I wrote the article and fully understand your response. I am a homeless campaigner and would love the chance to chat with you about this as you seem to know a great deal in he topic. It would be great to get your insight into what we can do differently and the best way to make sure nobody sleeps rough. Let me know if you can chat and I will send you my number. I am presently overloaded with work, 70-90 emails per day, mostly on this subject. It’s like running on a conveyor belt, just to not go further behind, but slipping backwards. I can’t make the time to walk 100m to an opticians for an eye test, after ‘Vision Care for Homeless’ kindly said that they would supply specs for me on production of a prescription. I am limited on PC time. All my threads, or irons, have become unfinished and disjointed, and need more correspondence, and work, to fill the gaps. eg the charities that I have tested, and am testing. I have to allocate some of the day to searching for food. I presently can’t take another thread on, but maybe a little later. I can see why the RoughSleepers crack, under this workload. In between the political posts, are many posts of what I have to say on this subject. I covered ‘charities’ again today on the Guardian, on the M&S story. and I think that this answers one of your questions. Before the Tories (Thatcher) came to power. Young people put their name on the Housing List at their local councils. When their name came up, they got a house. Thatcher sold off as much of the council housing as she could. Now there is less housing available. So much longer waiting lists. The fake ‘Homeless Charities’ saw this as a golden opportunity to get more money on our backs. So, they redefined ‘homelessness’, from being ‘RoughSleepers’, to anyone wanting a house, for whatever reason. The figures immediately shot up. They could claim that they were acting on behalf of a 10x bigger number of ‘homeless’. Bingo! they got more grants, awards, donations, and massive salaries. Young people that wanted to jump the queue for a house, would increase their chances of getting themselves to the top of the list, by claiming that they were ‘homeless’, under the new definitions, because they couldn’t stay at home. Wiser young people came onto the street for one night, to ‘RoughSleep’, to look more dishevelled at the housing interview, but had none of the normal paraphernalia that true ‘Rough Sleepers’ would have, and would be necessary to survive as a ‘Rough Sleeper’. Councils saw through this, scam, and offered family mediation, druggie & tramp hostels (emergency accommodation), etc, or turned them away as obvious scammers. When this rouse didn’t work, the young people went back home, to think of another, less cold, plan. The number of 1 nighters that we see doing this scam is uncountable. True ‘RoughSleepers’, couldn’t go back home, these can. There are many variations on the same theme, non provable sofa surfing is one. Recently the Tories have introduced sanctions. So wiser youngsters have taken advantage of a loophole of ‘homelessness’ to get out of any workfare obligations, missing appointments, job search, unpaid work, etc. Bingo! The number goes higher! More salaries for those living on backs. We can recognise the fake charities by their rejuggling & twisting of the statistics to make black white, and white black. Look for the statistics, if you want to spot them. Does no one listen to ‘More or Less’ on Radio 4? Even pro beggars have jumped on this free ride, on our backs, with only 9% being genuine ‘RoughSleepers’ at any time in their lives. The ‘new homeless’, have free access to the soup kitchens, free clothes, and foodbank food, where we have non allowed any, because you must have benefits first, and we don’t. So you have to be richer to get free food! So, everyone is on a jolly, getting money on our back, while the genuine ‘RoughSleepers’ starve to death on the streets, back alleys, or in the fields. The true number of genuine ‘RoughSleepers’ (‘old homeless’), is so low, that it would present no problem at all, to solve, if that was the intention. Allowing the redefining of ‘homeless’ by fake ‘Homeless Charities’, means that the problem will never be solved, but many charities, and clever businessmen, will make themselves extremely rich on our backs. Fake charities misuse this expression when writing. They interspace descriptions of how terrible it is to ‘RoughSleep’, then because there are not many of us, quickly switch to the statistics of ‘Homeless’, and hope that you didn’t notice the quick switch. The charities that use this expression would prefer to deal with ‘Homeless’, because, unlike the ‘RoughSleepers’, there is no call on their time to provide for them. Lets get rid of all this money earning fraud, on our backs, and start to give the true figures. The first step must be to get rid of the fake ‘Homeless Charities’. We need an official org, to take charge, with full accountability, and provide a service, as defined by the United Nations. Charities, and their lack of accountability to the UN, are a vehicle for malevolent States to get out of the United Nations rulings when they put whistleblowers on the streets. Maybe, that is their intention.